I love that the room was very spacious and that it was quiet at night. Also the location was absolutely perfect! Walking distance from the mall of Emirates and the metro so getting aorind was very easy. 24 hour supermarket up the street. 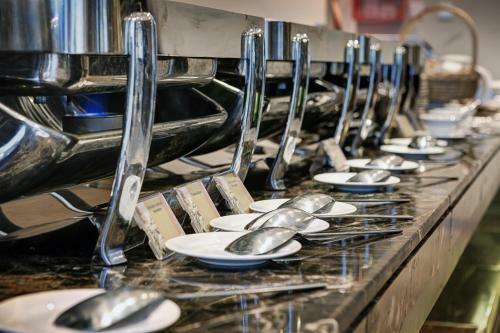 Also, the cleaning staff was very kind and helpful. Would definitely stay here again in the future. The room size, quality, furniture design, friendly staff. Overall in an era where hotel apartments leave out the hotel part, i was really pleased that Abidos provided all the basic requirements, as well a few extra as well as the sweet upgrade. 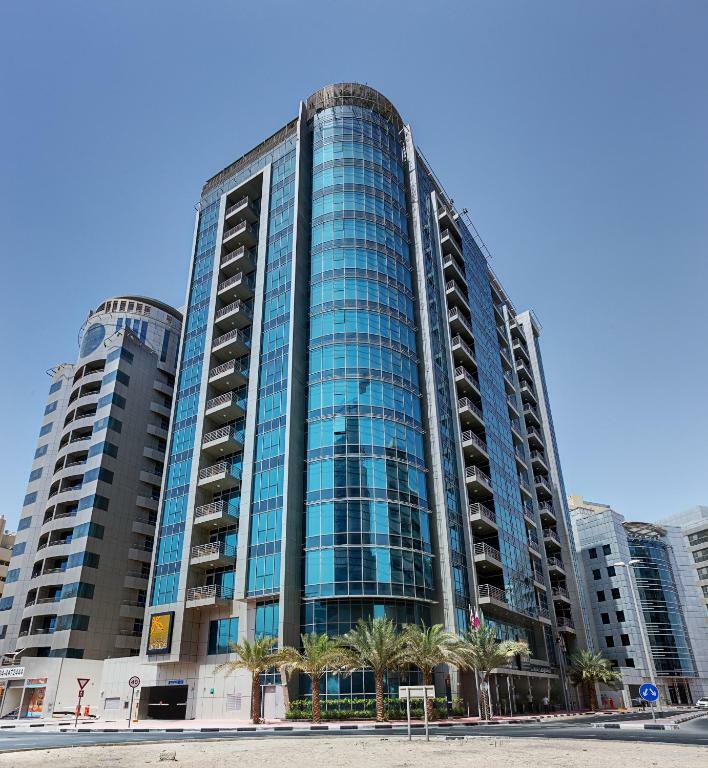 Location is very convenient for anyone planning to visit Mall of The Emirates which is also conveniently connected to a metro station therefore making commute hassle free. Value for money. So spacious. A bit of acoustic problem, can hear neighbour tv sound. I would like to thanks Ayra the front office staff she’s helpful and she finish the check in process fast , mashalla she’s so great with her attitude and assist.. I asked her for balcony room and she provide it even if the hotel is fully booked .. also the bell man he was so helpful.. thank u so much Ayra for your great assistance... but there’s one note for the hose keeping I hope that next time to have dentel kit ( tooth brush ) in the bathroom ..
Good location, comfortable, clean and has good facilities (pool and gym). Lock in a great price for Abidos Hotel Apartment Al Barsha – rated 8 by recent guests! This luxurious hotel offers stylish apartments next to Mall of the Emirates, in Dubai’s Al Barsha district. It features a gym, a rooftop pool and free Wi-Fi in all areas. All of the exclusive guest apartments at Abidos Hotel Apartment Al Barsha are generously appointed with 2 bathrooms and a fully equipped kitchen. A large living area features a flat-screen satellite TV and air-conditioning. The all-day restaurant, MnM, serves international buffets and à la carte menus for lunch and dinner. 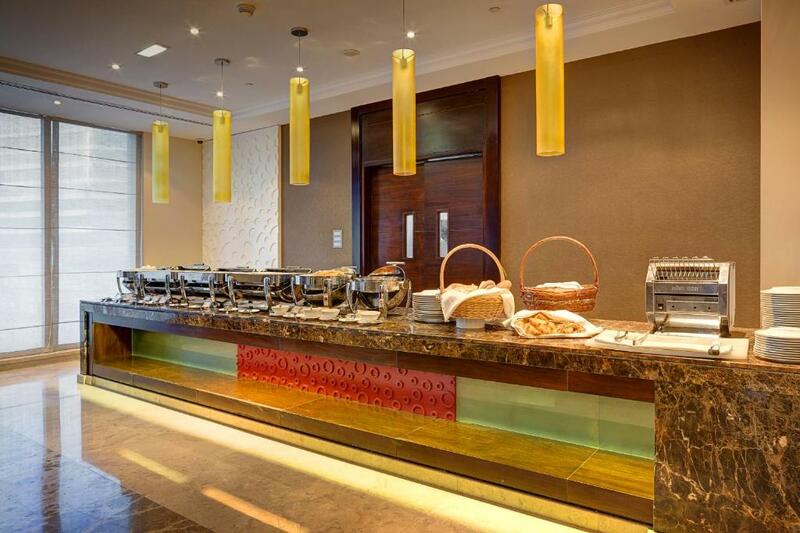 Alternatively, you can have light snacks and beverages at the lobby lounge, MnM Cafe, and MnM Lounge is the perfect place to enjoy a bite by the pool. 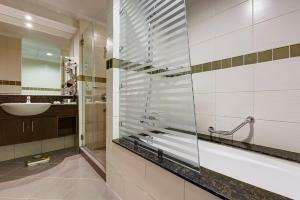 Guests can use the fitness center or relax in a hot tub or sauna. 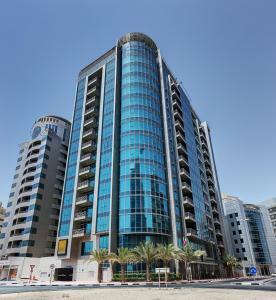 The hotel is 3.7 mi from the Palm Jumeirah, and 5 mi from Emirates Hills Golf Course. 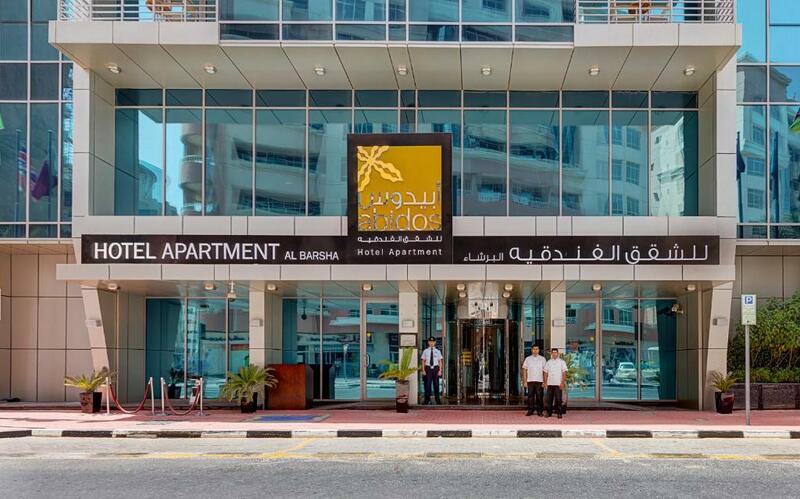 Abidos Hotel Apartment Al Barsha is just a few minutes’ walk from Mall Of The Emirates Metro Station, providing easy access to downtown Dubai. Dubai Parks and Resorts is a 20-minute drive from Abidos Al Barsha. Free on-site car parking is available. 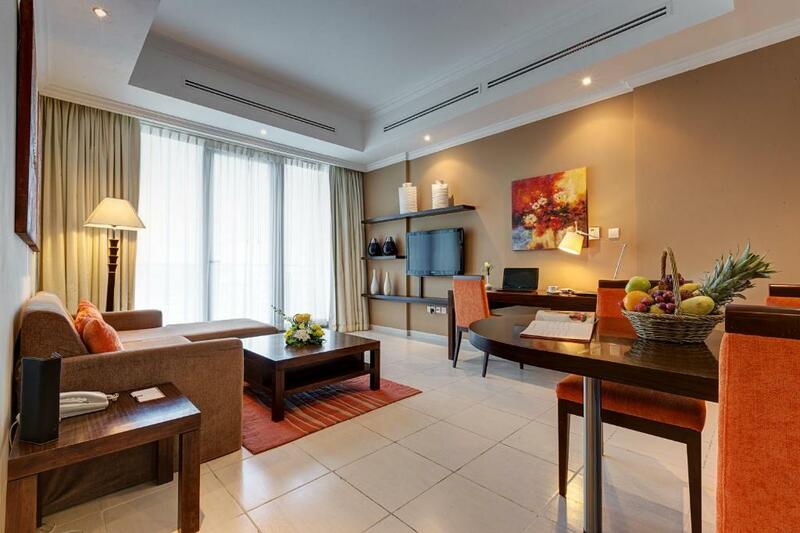 When would you like to stay at Abidos Hotel Apartment Al Barsha? 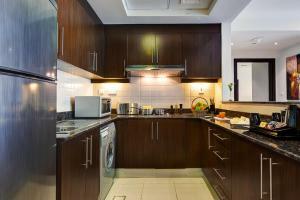 This spacious apartment has an extra large bed and a flat-screen LCD TV. The private bathroom includes bathrobes, slippers, and free toiletries. The living room features a flat-screen satellite TV. The suite has a dining area and a kitchen with a refrigerator and a stove. This spacious apartment has a private balcony, an extra large bed, and a flat-screen LCD TV. The private bathroom includes bathrobes, slippers, and free toiletries. Luxury amenities include two spacious bedrooms, a master bedroom with double bed and a double bedroom with twin beds, a modern kitchen and two spacious bathrooms equipped with bath and walk-in shower. The trendy decor features neutral color that create a pleasant, relaxing atmosphere. It includes a living room with a flat-screen TV. Featuring a balcony, this air-conditioned apartment includes 2 spacious bedrooms, a master bedroom with double bed and a double bedroom with twin beds, a modern kitchen and 2 spacious bathrooms equipped with bath and walk-in shower. The trendy decor features neutral color that create a pleasant, relaxing atmosphere. House Rules Abidos Hotel Apartment Al Barsha takes special requests – add in the next step! One older child or adult is charged AED 144 per person per night in an extra bed. Abidos Hotel Apartment Al Barsha accepts these cards and reserves the right to temporarily hold an amount prior to arrival. Please note that all guests must present a valid UAE ID or original passport upon check-in. Guests are required to present the credit card used to make the reservation. If the credit card's owner is not the guest then the payment cannot be completed and a valid credit card or cash payment from the residing guest will be required upon arrival to cover the entire stay. Please note that children aged 7 to 12, breakfast is not included in the price. Charges may apply of AED 22 per child per day. had to chase up the staff for towels on a number of occasions. Everything good in this hotel clean and good location with very gd stuff specially Mss ayra and Mss jessica I really appreciate how nice they r and professional.